Life is doing what it wants though it can be influenced. Dying is just a part of life. At least it used to be. Humans can do the worst and the best. We are free to choose. Humans should do more right than wrong. If only it were that easy. The world needs more people who doubt. The most important thing in life is not to forget where you are coming from, to keep in mind where you are going to and to live meanwhile. The past is gone. That we should learn something from it is a kind of fruitless comment as we obviously don’t do it – generally speaking and left with glint of hope that one day we will. Future means probably a lot of surprises, maybe not only good ones. But who knows? Love is the most beautiful and the most frightening of all feelings. Having friends is what keeps you going when everything else fails. Happiness is a clin d’œil, a snapshot, nothing which will last forever and still worth working for. Feelings are uncontrollably frightening, beautiful, painful, overwhelming, amazing. Conflicts are inevitable. To get out of them successfully is the real challenge. Hope is often not rationale but prevents from going insane. To have faith is comforting. Dreams are a biochemical process the brain is running to deal with all the input it gets. They are a powerful motivation as well but that’s the other kind. Change means that nothing stays the way it is and that it is better to get used to it. Courage means to dare even if the chances of success are small. To loose is sometimes better than to win though you never know. To win means nothing. How you do it and what you do afterwards is what makes the real difference. Being perfect means that nothing can be improved. Not very likely to happen. Failure is part of life. How can humans learn if they always win? Would be a bit boring, after all. Pain is nothing we can ever get rid of entirely.To be dealt with. Health is treated badly when having it and longed for when lost. To work is a necessity, ideally an enjoyable one. Achievements are nice but nothing to be rested upon. Strength is not to give up even if you feel doing so. Fantasy can make you forget all worries for a while. Justice is an abstract. Often searched, rarely found. Creativity is what I’m running out of. * Stöckchen in German. Found here. I’ve been informed that not everybody understands the principle of a Stöckchen. Well, the basic idea is that you take the given part (bold text) and you fill in the rest with your own thoughts, ideas, etc. Pretty easy. 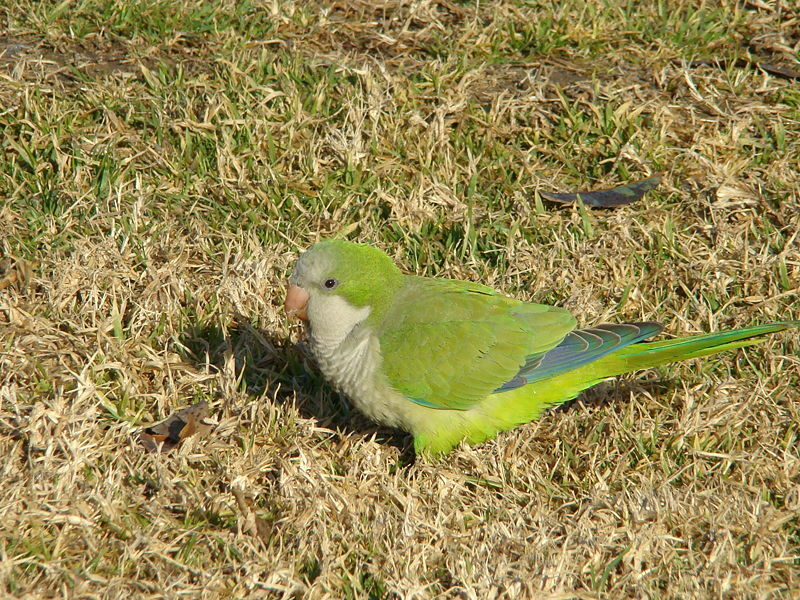 To be more precise Monk parakeets. These are cute little parrots I’ve seen in and around Brussels about a dozen times. I noticed them especially by their thrilling screams in the Park Woluwe, around my working place, Bois de la Cambre and other areas. It’s fascinating to see how well some species coming from warm South America adapt to cold European seasons and especially winter. The only ‘problem’ is that it’s very difficult to take a picture of them as you can hardly tell what is bird and what is leaves in a tree. Perhaps this will improve in winter times. We’ll see. Thanks to Tof People, I had the chance to visit the exhibition “C’est notre histoire” “It’s our History“. Together with a friend, we had a guided tour through this exhibition mixing contemporary art, citizens’ involvement, historic specimen, the build-up of the institutions, and much more. Since the purpose is to demonstrate that every citizen is shaping Europe (and it’s institutions) as much as Europe is shaping every citizen’s life, I agree with the guide who pointed out that the better English translation would have been: “It’s our Story”. The exhibition resumes somehow in the quotation “It’s because we share a common history dating back more than 2000 years that a European union could be built in 50 years”, translated from the slightly but crucially different French statement: “C’est parce que nous partageons une histoire commune de plus de 2000 ans que l’unité européenne a pu se réaliser depuis 50 ans”. Of course, translation is hell, nothing new but still the statement itselfs leaves me with some doubts. 1950 years, two world wars, human life sacrified for ideologies to build finally something decent in the last 50 years? Not very balanced. Common history – that meant as often fighting eachother than doing business. It meant conquering the world but be careful that not too many foreigners come here or even worse stay (unless they have an engineer’s degree). It also meant peaceful change, people(s) standing up for freedom and democracy. It’s easy to be a fan of European union today though it is not always easy to be proud of our past and to me it shows that Europeans should be careful about giving lessons to other parts of the globe. If you are still interested in the different reasons why Belgium may/should/won’t split up, here is an article from the FT, giving an interesting historical, linguistic and political overview. The end of the article is quite characteristic for the situation here – there is none. No conclusion, no decisions leaving the impression that the situation is a bit weird and that nobody really knows what to do about it. Thanks to a friend, I got some figures underlying yesterday’s post. The research about language mastery in Belgium was done by Belgian and American professor. The newspaper article where it was published is one year old and you can find it here. Il faudra vraiment faire un effort. Last Sunday, 35.000 mainly French speaking people demonstrated in Brussels for a united Belgium. One thing I would like to know is if these people would agree to live and work for a truly mutual understanding. Actually, what I do not understand is how Belgium managed to let one of its biggest advantages become one of it biggest problems: the languages. If you consider that Belgium could be an example in Europe regarding multilingualism, attracting investment, tourists, and so on, it makes me afraid to see how much the people here fail to do so. What I’m trying to point out is that Belgium would have not only political but also social and economical advantages if only they had a decent education in language matters. This would basically mean that every citizen in this damn country has to learn French and Flemish. After this, English, German, Spanish or whatsoever could follow. If you think a bit further, then you realise that French is an excellent basic to learn other Latin languages from, while Flemish is helpful for German and the Scandinavian languages. As already mentioned before, the Flemish do quite an effort to learn French. But the Wallonians, for a big part, just ignore Flemish deliberately*. They adopt this kind of French (franco-français) attitude towards language which is basically resumed in the sentence: “De toute façon, on est nul en langue”* “We are bad in languages anyway”as if it were a genetic problem. Not only that this is stupid surrendering without even trying but it reinforces the distrust between the different linguistic communities. What could (and should) be done (in my point of view) is to make a general linguistic education, of let’s say 6 years compulsory during which the language of the other community has to be taught – especially Flemish in Wallonia. Within ten years, 15 years from now, Belgium could have a bilingual population instead of two parts not understanding but deeply disliking each other. Perhaps I’m too idealistic but if the Wallonians and the Flemish really want to live in an one and united Belgium, they will have to make an effort going beyond demonstrations on a sunny Sunday. * Disclaimer: I am generalizing. I met more than one French and more than one Wallonian who do not at all agree with this attitude and blame their compatriots for it. But it is dreadfully common. Of course the whole language discussion is just one of the many issues but in an Europe laboring for unification through encouraging cultural diversity it is ridiculous how much space this aspect takes.